A Gangster and Cop story and the Corruption that lies within the system of Politics in the country. The first episode Premiered last night and set high expectations from the makers. The Casting is one of its kind ,since we haven’t really seen SaifAliKhan Who portrays the Role of Cop Playing the Character “Sartaj” and Nawazuddin playing role of The Gangster “Ganesh Gaitonde.”While Radhika Apte play’s the character of an intelligence officer assisting Sartaj. It’s a first of its kind Thriller Show coming from India with a huge star cast and Director like Anurag Kashyap & VikramAditya Motwane who are known for their Filmmaking style like Gangs of Wasseypur & Udaan. Sacred Games is produced by Phantomfilms In Collaboration with Netflix. And looking at the first episode that establishes the series to know what exactly happens next? And Why Ganesh Gaitonde chooses Sartaj to get in touch and give the lead of saving this city “Mumbai” to Sartaj Specifically. And tells him if he could save the city in the next 25 days that he has. The Theme song “Kaam” is by Divine Rapper and a Catchy track for the show “Sacred Games” who’s Central plot is corruption & Mafia. The show will be Aired on Netflix from 6th July 2018. 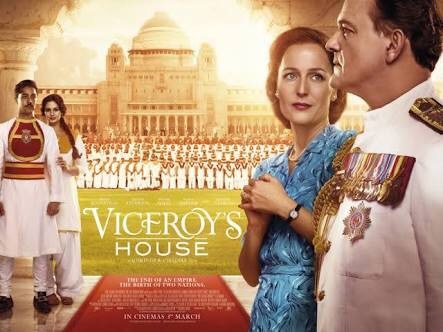 “Viceroy House ” film on the British-Indian About the inside life of the viceroy’s House in 1947 during the Partition of India.The Plot revolves around the final Viceroy of India, Lord Mountbatten,who has to oversee the transition of British India after independence ,but meets with conflict as the two sides clash in the face of monumental change. Downstairs in the servants quarters, Mountbatten’s new manservant, Jeet falls in love for the daughter’s assistant, Alia and all manner of obstacles of caste are put in their way. The film stars Huma Qureshi Popular Bollywood Actress, Manish Dayal Played hassan kadam a chef in 100 Foot Journey Hugh Boneville known for his role in Downtown abbey Robert Crawley and Earl of Grantham plays Lord Mountbatten and Gilian Anderson playing Lady Mountbatten popularly known as DR Bedelia Du Maurier in hannibal. The film aesthetically in terms of the art direction,Costume is very authentic, takes you back in time 1940’s during the fight for independence.It also answers few of our question,Who was responsible for the partition. Was Nehru and Gandhi’s Ideology always different ? A story based on true events, but not too dramatised. and Crisp. You cannot miss this one. Produced and written by Gurinder Chadha,Paul Mayeda Berges and Moira buffini Music by A.R Rahman Directed by Gurinder chadha.Paul Mayeda Berges has also written Bend it Like Beckham & Bride and Prejudice Both Directed by Gurinder Chadha . Trivia He is also Gurinder Chadha’s husband.